Biobserve has just released their new 2017 version of the Viewer video tracking software: Viewer 17. It has many new features. For example, it introduces advanced video controls, freely customizable set of summary intervals and a revolutionary competence which allows for continuous tracking of animals irrespective of local changes in illumination. You can read more detailed information below and of course you can request a quote or contact us with any questions you might have. Inspired by single arenas or multi-arena setups with irregular conditions of illumination, Viewer 17 now introduces a revolutionary competence, which allows for continuous tracking of animals irrespective of local changes in illumination. 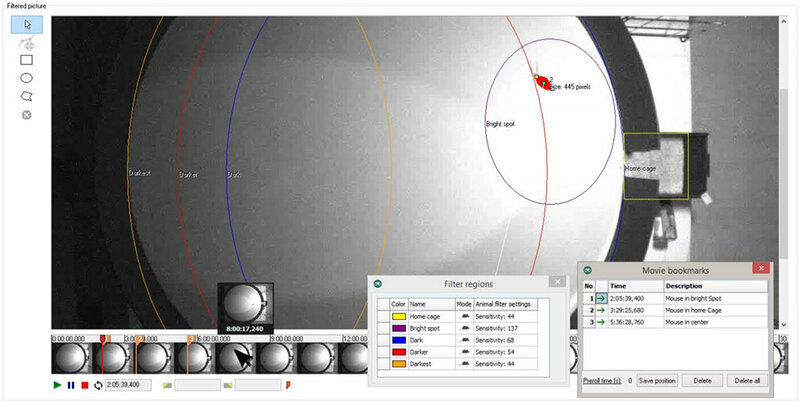 Regardless whether you would like to analyse live images in real-time or video files already in existence, the renowned usability of Viewer will allow you to straightforwardly optimize tracking settings, and save them to a specific configuration in order to maintain reproducibility across experiments – no matter how complex and irregularly illuminated your setup appears to be! The concomitant occurrence (or the temporal relationship, respectively) of certain parameters might give you important insights regarding the temporal organisation of behavioural performance. Viewer 17 therefore introduces an innovative visualization, which will provide you with customizable and comprehensive overview of the temporal organization of parameters. This functionality – the data replay – will organize parameters and automatic behavioural annotations of your choice along the temporal domain, as soon as you acquired your data – just one click away! Especially in the context of analysing large video files of experiments with drastically extended time-scales, handling your video file (e.g., search for certain episodes, and focus on certain content) might be less efficient than the busy agenda of your lab would allow for. 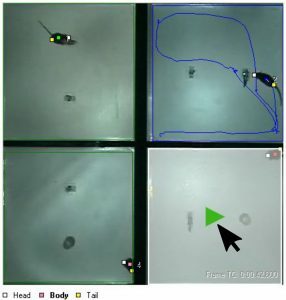 Therefore, Viewer 17 now introduces advanced video controls, which allow you to efficiently handle your video files – no matter how extended your experiments are! individual arenas individually – even if your arenas are recorded by a single camera! Not all episodes of your experimental paradigm require the same temporal resolution when it comes to the analysis of behavioural performances. You might want to focus on details during episodes of increased interest (e.g., operant reactions), while you might prefer an all-embracing, less detailed overview during other episodes (e.g., spontaneous behaviour during habituation). Thus, with Viewer 17 you will be able to define a freely customizable set of summary intervals, even before you start the acquisition of your experiments. During the inspection and analysis of your data, you will be able to switch between your choices of temporal resolutions – and thereby increase the efficiency of your analysis with just a few keystrokes!